Follow the DeepWater Horizon Oil Spill! 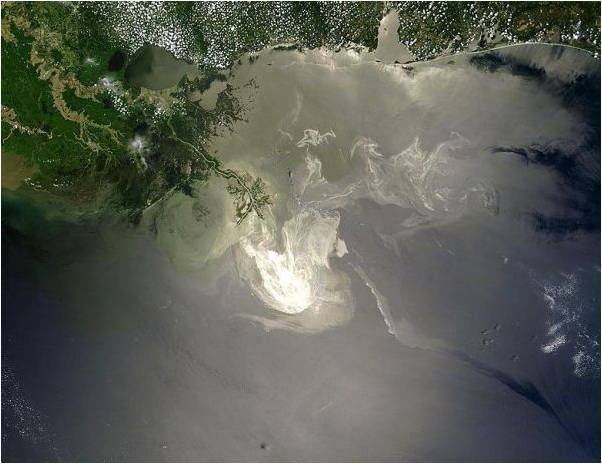 DeepWater Horizon Oil Spill as captured by NASA’s Terra satellite on May 24, 2010. The Gulf of Mexico oil spill that resulted from the explosion of the DeepWater Horizon oil rig on April 20, 2010 has been labeled the worst oil spill in U.S. history. This environmental disaster has caused great harm to the marine and coastal ecosystems along the vast extent of the oil plume. The media coverage of the Gulf oil spill has peaked the interests of many students who are interested in learning more about the impacts of oil spills on the environment. Click on the links below for resources and activities on the Deep Water Horizon Oil Spill.